In the last week or so the polling website May2015 has convincingly put forward the thesis that even if the Tories win the most seats and votes on May 7, Ed Miliband is the likelier Prime Minister. This has significant implications for the stability of Britain’s democracy over the coming weeks. In fact, the situation may be even more precarious than it seems, with neither Labour nor the Conservatives able to establish a majority, even via coalition. To see why this will be so difficult, we must look not only at the numbers but also the differing ideological leanings of the parties. Europe is the key issue. Those, such as Dan Hodges at the Telegraph, who are still betting on a Tory-led government, believe that the Tories’ aggressively insisting the SNP will pull the strings if Labour come to power will have a significant pro-Tory impact on English marginals as polling day approaches. This may well happen, though it is still to show up in the polls. With the Tories coming out as the biggest party in terms of votes and seats, the assumption from those backing Mr Cameron to stay in Number 10 is that “if the seats are there,” the Liberal Democrats will do another deal with Cameron and we’ll have coalition 2.0. Taking out the anticipated 5 Sinn Fein seats (their elected MPs do not sit in the House of Commons), plus the Speaker, the magic figure for the slimmest of working majorities is 325 seats. Let’s imagine for sake of argument the Tories reached 302 seats, which is well beyond the highest predictions of any of the main polling indicators, with the Liberal Democrats on a more realistic 23. This would give the two coalition parties 325 seats. On that basis, can the Liberal Democrats really carry on propping up the Conservative Party? The coalition vote share would have fallen, with both parties losing seats. Looking ahead, the Tories promise much deeper (albeit unspecified) cuts. And most importantly, they have proposed a referendum on Europe. This situation will be very unappealing to the Liberal Democrat membership. We should also think not only about divisions between but also within parties. A sizable rump of Tory rebels has consistently voted against the coalition throughout this parliament. They mostly detest the Liberal Democrats, and they have turned themselves into a single issue cabal with their fundamentalism over the EU. Happily, Labour has had a very good fortnight. Since my last column, Miliband’s personal ratings have jumped up and the Tory campaign has blundered from unforced error to unforced error. Bookies and polls now put him as neck and neck with Cameron as next PM, not lagging way behind as before. The final piece of this recovery in both results and performance, last weekend, was a quite unexpected outreach programme from Labour to the centre ground, of which more later. After the last election, the new prime minister, formerly known for his husky-cuddling and his “greenest government ever” shtick suddenly remembered his back benchers and became, for the most part, a much more traditional kind of Tory. Nowhere has this been more evident than in his Europe policy, where he essentially caved in to the more rabid Eurosceptic elements in his own party, in the hope of stemming the flow of voters and defecting MPs to UKIP. If, as some are predicting, UKIP ends up the election having lost Thanet South and with merely a couple of MPs, he will surely look back on this decision to pander to their agenda as one of the utmost folly. That game is not only dangerous for Britain, it is poor internal politics for Cameron: after all, his (almost universally pro-EU) big business backers can hardly be delighted at the prospect of an EU referendum. But in any event, it is not hard to paint the Tories as having lurched into a right-wing caricature of themselves. On the other hand Miliband, for the majority of his tenure as leader, has often given the impression of being more mindful of his party at large than of the electorate outside, with the result that Labour’s policy agenda has mostly languished in its comfort zone on the soft left. There was one brief flicker of hope that Labour would once again embrace a broad church, around the time of Miliband’s 2013 “One Nation” conference speech: but in policy terms One Nation turned out, for the most part, to be a slogan, and little more. Politics is a lot like the game of squash: those who dominate the centre of the court tend to dominate the game. He’s back. The most successful prime minister – nay politician – ever to grace British parliamentary democracy. A man of such grace, skill and power that he swept all before him in his pomp. Adored by his own. Feared by rivals. Yesterday, he spoke and we – humble electorate – must heed his wise counsel. I speak, of course, of Sir John Major. Well, that seems to be the absurd narrative pedalled by the electorally-charged right-wing press that once lampooned Major’s premiership. Times change. Major’s speech gave warning of the higher taxes, fewer jobs and general mayhem of a Labour government supported by the SNP. Firstly, he’s right. A Labour/SNP deal would be a disaster for Britain and the Labour party as well. There would be an economic chilling effect around new investment into the UK while the PLP would be split over any arrangement with the nationalists. In fact, I was warning about it on this blog before it was cool. But, as many have pointed out, it was John Major’s Government in the 1990s that actually did deliver higher taxes, fewer jobs and general mayhem. Look at the facts. There’s Black Wednesday, when a self-inflicted economic crisis pushed the Bank of England’s interest rates to a crushing 15% in September 1992. Labour chiefs are happy with progress in the campaign so far. Most activists are upbeat. Even PLP pessimists have been given to moments of optimism. But for all the pleasant mood music – from the poll averages which suggest Ed Miliband is within touching distance of victory to the parliamentary number-crunching which seems to offer manifold routes into Number 10 – Labour’s campaign strategists have misread their three biggest strategic challenges: how to deal with the Tories’ SNP scare, which voters to target with the ground operation and what retail offer to make. Over the next fortnight, the impact of these mistakes will become clearer. Most immediately, Labour has utterly failed to understand the Tories’ intent with their scaremongering over SNP support for a Labour government. The view of Labour staffers has been that the Tories are principally trying to frighten Ukip voters back into the Tory fold. But that for every vote the Tories get back on their right flank the more they accentuate their negatives as the nasty party with wavering voters. The Labour analysis is correct about appealing to kippers but wrong about the impact on swing voters, specifically English swing voters. Labour’s more frantic recent statements, denouncing the Tory attacks as “smears” – a sure sign that a political party is becoming panicked and does not have a line to take – suggest that the impact of what’s happening has started to dawn on party strategists. The Tories’ objective is to fuse the SNP and Labour in English voters’ minds. This vision of McLabour as an unabashed, economically left-wing party that will prioritize Scotland’s interests over England not only scares ex-Tory Ukip voters into switching back, it resonates with right leaning and centrist Lib Dems not to mention the quarter of 2010 Labour voters who have since abandoned the party. The problem with Labour’s ‘BAME manifesto’ – and its approach to understanding minority communities more generally – boils down to this: In the Labour lexicon, BAME (Black and Minority Ethnic) is simply a question of skin colour. The term is exclusively meant to denote non-White groups. It’s an approach that makes as much sense as assuming you need to be a wheelchair user to be a disabled person. The party shows a poor grasp of the complexity of the UK’s contemporary racial and ethnic mix and the often very specific and nuanced issues they face. As a result, the document falls back on 1980s norms. Hence, all the photos in the document show group shots of smiling Black and Asian people. So far, so clichéd. The manifesto shows little understanding of just how fluid it is to be a member of, say, the Afro-Caribbean or Muslim communities these days, while seeming utterly oblivious to the concept that there may be White ethnic minorities out there and they, too, may have needs. For instance, the numbers of Polish-born people living in the UK have increased 10-fold in a decade, from around 60,000 in 2001 to 580,000 at the time of the 2011 census. To this we can add a further 200,000 ethnically Polish children and grandchildren. Nearly a million-strong. Yet, the manifesto utters not a single word about their particular needs. At the very least, the manifesto could have included promises to crackdown on unscrupulous gangmasters and tighten regulation of the casual labour market, an issue that disproportionately affects migrant eastern Europeans coming here in large numbers to work. Neither is there any mention about Gypsies and Travellers. This is especially remiss given the massive cultural and social disadvantages they face, including a level of overt public ridicule and discrimination for their lifestyles and customs that would (rightly) be beyond the pale if targeted against any other minority group. Scotland is diminished inside the UK, argues Alex Salmond. The UK is diminished inside the EU, says Nigel Farage. Scotland did not vote for David Cameron, insists Salmond. The UK didn’t vote for Jean-Claude Juncker, maintains Farage. It would be “nae bother” for Scotland to break up the UK, asserts Salmond. It would be “no problem” for the UK to leave the UK, claims Farage. Salmond briefly seemed a broken man after the defeat of Yes last September. Having promised to resign the leadership of UKIP if he doesn’t win South Thanet, defeat for Farage on 7 May would also leave him broken. But Salmond has been reborn, as support for Yes has wholly transferred to the SNP. Farage might be reborn too. Salmond’s rebirth has been enabled by glacial shifts in Scottish opinion that now appear to have unstoppable momentum but which built up over a long period, going undetected by those focused on Westminster. No Scottish seats in the UK parliament changed hands in 2010. The SNP gained two seats at the 2005 general election and lost one at the 2001 general election. The churn over the same period in elections to the Scottish Parliament, however, was much more dramatic. The SNP gained 20 additional seats in 2007, 23 in 2011. Any coalition deal with the other parties that involves sharing cabinet positions, will inevitably mean the percentage of women sat around Labour’s top table will get smaller. This is not due to backsliding on Ed Miliband’s part. Far from it. He promised during the Labour leadership contest – and has consistently repeated it since then – that he will deliver 50:50 gender equality around the cabinet table (and has more or less done so with his current shadow team). It is simply that the stock of female ministers from the other potential coalition partners is extremely low. And despite watery protestations to the contrary, all the current polls indicate that Miliband will need either the SNP or the Lib Dems to join his administration in order to form a stable working majority in the Commons. Similarly, just seven of the Lib Dems’ 57 MPs in the last parliament were women and five of them are likely to lose their seats (although, to be fair, it’s perfectly possible this number will be replenished with newcomers). But from day one of the next government, there will be precious few women MPs from among either the Lib Dems or SNP experienced enough in frontline politics to be considered for cabinet positions. The only choice open to Miliband, if he’s serious about honouring his pledge, is to appoint a greater number of Labour women to meet the shortfall. This, in turn, means appointing fewer men who currently sit in the shadow cabinet. The in-tray of an incoming prime minister is deep enough without creating that kind of explosive row and in the process generating an officer-class of senior, overlooked men who have slogged away on the frontbench for years only to have their careers ripped away from them. No, look instead for Miliband to pepper the junior and middle ministerial ranks with women as cover for the Labour-led government’s first U-turn. Ukip is losing and its future is bleak. Its poll rating is being squeezed and its manifesto was an aimless ragbag of populist ideas. It wants to attract lefty Labour voters and right-wing Tories so it ends up with an incoherent, hollow message. The manifesto wanted increases to the carers allowance and an end the bedroom tax while slashing income tax for the wealthiest. The only thing they can all agree on is leaving the EU and attacking immigrants. This unholy alliance will boil to the surface after the election, especially if Nigel Farage loses in South Thanet and has to quit. The seeds of the discontent were sown at the party conference in Doncaster last year with the party riding high amid defections and rising polls. At an Institute of Economic Affairs fringe event on economic policy was the libertarian immigration spokesman and MEP Steven Woolfe and the economics spokesman and MEP Patrick O’Flynn. MEP Tim Aker and Tory activist Tim Montgomerie were sat by their side and the session was hosted by ex-Lib Dem and IEA director-general Mark Littlewood. Earlier in the day, O’Flynn had set the conference tone by unveiling income tax cut proposals for middle earners by raising the 40p threshold and introducing a new 35p band. But he also unveiled a “wag tax” proposal to increase VAT to 25% on luxury goods such as expensive cars and shoes. In our second installment, Uncut’s weekly review of the campaign looks at the events of week 3. Sunday 12 April – Marr and Osborne. The core Tory strength is a reputation for fiscal probity. Yet here was prime time Osborne appearing anything but. After more than five years when it has usually seemed that only one party, the Tories, know how to make their sums add up, Marr suddenly left the impression that this party is Labour, not the Tories. Sam Dale has previously argued on Uncut that the Tory advantage on fiscal credibility is so well established that they can afford, as they certainly now are, to play fast and loose with it. In doing so, though, they deepen a theme of the Tory campaign identified by Jonathan Todd: taking people for idiots. If Labour keeps showing how our policies are costed, the Tories might just find a trump card slipping away at the last, crucial moment. The team managing Labour’s events deserve some recognition. Often overlooked as the plaudits go to the more flashy spinners, events folk only tend to get mentioned when something has gone wrong. But for Labour, trying to shift some pretty entrenched pre-campaign stereotypes, the backdrop and staging of the set-piece events needs to provide the pictures that validate the message. If anything were to go wrong – as at Ukip’s campaign launch when the blu tak came unstuck and the backdrop fell down – then it’s a lock for the news bulletins as a metaphor for a campaign in trouble. This week’s manifesto launch was another in a growing list of impressive events. The message was about responsibility and fiscal discipline and the pictures of Ed Miliband at the event reflected this exactly. Paralysing fear has infected every aspect of the parties’ campaigns. Strategists fear the voters, so they stage tightly controlled events, away from the truculent public. Junior staffers fear any slight mishap that might make the news, so even the most minor decision is dictated by a safety first doctrine. And Ed Miliband and David Cameron fear everything and anything, otherwise they would not accept the counsel of caution from their advisers which shackles all that they do. The result is an arid campaign, a dismal parade of media moments contrived for broadcasters that lack the incident and passion to galvanise anybody but the already committed. A news vacuum is developing. 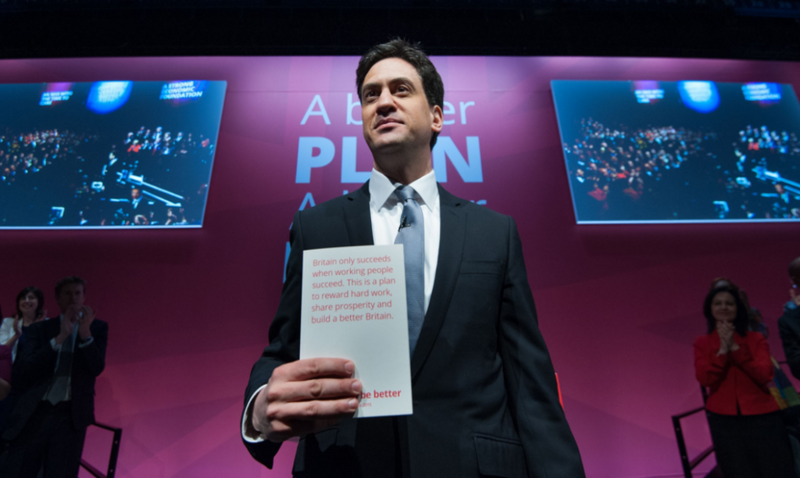 The manifesto launches commanded attention earlier in the week, but now what? The front pages are already drifting away from the election. Soon, as is always the way in politics, this lacuna will be filled with the grumbles of worried candidates and plotting leadership contenders, taking aim at their leaders. It doesn’t have to be this way. For the party bosses running the party campaigns, there is an alternative. 1992, which has already provided much of the template for this contest, also offers a lesson in how to fill that vacuum without the need to scramble out new half-baked policy announcements dreamt up the night before or to escalate the ferocity of personal attacks to shock a path into the news. Imagine if one or more of the party leaders took a leaf out of John Major’s book and didn’t just do managed Q&As with pre-vetted, politically emasculated supporters, but actually went out to meet the British public on the high street, in the shopping centre and at the market. If they went to where the public are, rather than hiding in a hall ringed with security, put down a soapbox, stood on it and spoke to real voters. Jim Murphy is Scottish leader in no small part because of his one man campaign across Scotland in the independence referendum, speaking to the Scottish public from atop his Irn Bru crate. There were baying nationalist mobs, protesters, eggs, but also, fabulous pictures for print and broadcast, personal guts and raw emotion. The plaudits from journalists or every persuasion – right, left, nationalist and unionist – after the clip below was shared were extraordinary. It’s hard not admire Jim Murphy’s passion, resilience and commitment.